Since Super Bowl Sunday is right around the corner, we thought we’d better dig up some easy guacamole recipes. Here’s one of our faves. It’s not a football party without guacamole and chips. 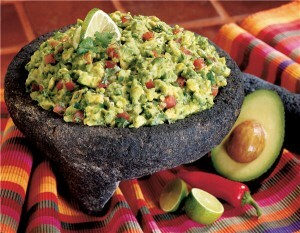 In fact, the Super Bowl is the number one day for guacamole consumption. Football fans will eat more than 100 million pounds of avocados. Avocados are nutritional all-stars that provide nearly 20 different vitamins, minerals and antioxidants. They’re also rich in mono and polyunsaturated fats which are known to be good for your heart’s health. When you make guac for the Big Game, forgo recipes that call for mayo our sour cream because avocados are naturally rich and creamy, you don’t need to add more creaminess to them. Making guacamole is easy so there’s no reason to resort to store-bought options that may be light on real avocados and heavy on additives. What’s more, a serving (2 tablespoons) of most store-bought guacamole has about 120 calories and 10 grams of fat, but this recipe has about half as many calories. In medium bowl, combine all ingredients and blend together. Mash the avocado according to the consistency that you like–chunky or more smooth. Serve immediately.